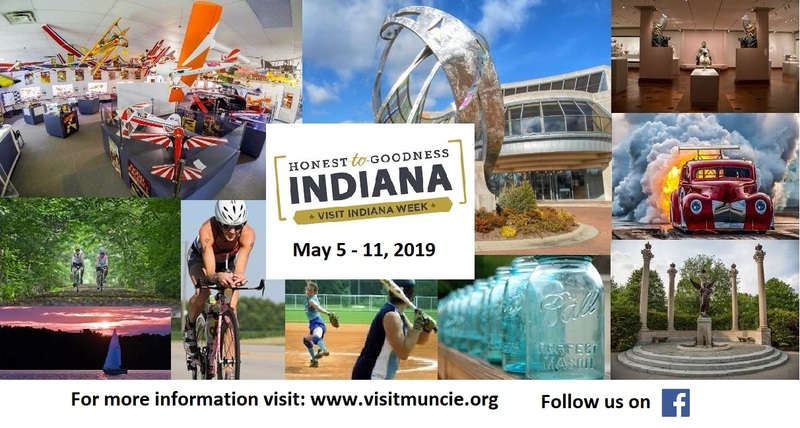 2019 National Tourism Week - Muncie Visitors Bureau | Visit Muncie! Join us is celebrating National Tourism Week, May 5-11. We will be highlighting the many tourist attractions of Muncie/Delaware County on our Facebook page all week long. We will be focusing on: Monday – “Get Moving Monday- Tourism impact on Delaware County”, Tuesday – “Tasty Tuesday” – highlighting our local dining options, Wednesday- “Wayback Wednesday” – focusing on the local Arts and Culture attractions and museums, Thursday- “Thirsty Thursday” – centering on showcasing the local breweries and winery, Friday- “Family Fun Friday” – drawing attention to the plenty of fun family things to do in the area, and Saturday- “Sweet Saturday” – we will be showcasing the variety of specialty goods for your sweet tooth. Also, don’t miss our annual National Tourism Week cookout on Thursday May 9, from 11:30am – 1:30pm at the Delaware County Building, 100 W Main St.